St. Joseph Catholic Hospital de Monrovia (Liberia) in July before it was closed. Over the years, I have been blessed with the privilege to visit and accompany Caritas and other Catholic Church-inspired organisations in Africa as they responded to the epidemic of HIV and AIDS. I always received warm greetings of welcome and warm handshakes even when people were traumatised by the massive loss of life that resulted from AIDS. On my present visit to Liberia, however, I found a “different Africa.” From the moment that our plane touched down at the Monrovia airport, we were confronted with buckets of bleach water with which to wash our hands and with people armed with “gun thermometers” to take our temperatures before we could even step into the terminal building. Perhaps the most striking difference from my other visits to Africa was found in the “no touch” policy. Africans usually are warm and physical in expressing welcome – they usually offer hearty handshakes. 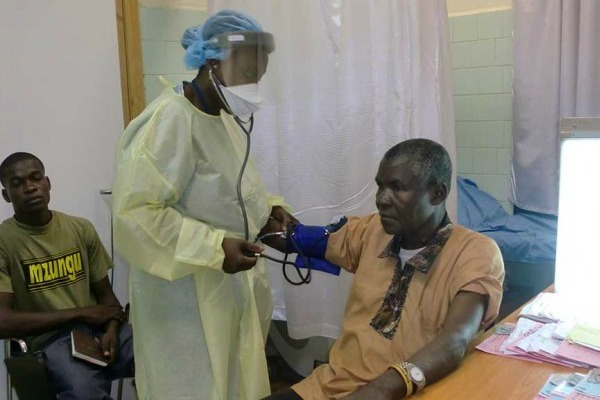 Now, in the Ebola-affected countries, everyone seems uncomfortable as a result of the need to avoid physical contact in order to prevent further spread of this virus. On our way into the city, Sr. Barbara Brillant, a Franciscan Missionary of Mary, who is serving as my host, rolled down the window of the car to reprimand a young man and a young woman who were holding hands while walking on the street and she reminded this couple that they should not be “touching”! The Ebola situation in the country is very grave. Regarding the impact of the Ebola infection itself in Liberia, there are 914 confirmed infections, likely in 1534, and 1005 suspicious – for a potential total of 3458 cases. Deaths due to Ebola: 792 confirmed, 623 probable and 415 suspect for a potential total of 1830 deaths due to Ebola. Many hospitals and clinics are closed, so it is very difficult to get medical treatment for other diseases. Some people die in the streets looking for medical treatment for infection or for a whole host of other diseases. Schools and many government offices are closed. This means that families do not have enough income to provide food and other necessities. Health workers — doctors, nurses, and others –are afraid to go back to work. But also the socio-economic impact is very dire. This is a country that just emerged from years of conflict and war and now must deal with the “war” on Ebola. In the communities in which quarantine has been imposed in order to eliminate the risk of further spread of infection, people do not have access to food, clean water, and other necessities. There is a general sense of psychological trauma and anger among the people; several people shared with me their fear that social unrest and conflicts will soon begin again. Br. 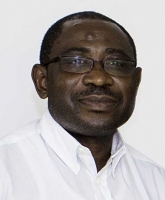 Patrick Nshamdze, hospital director of Catholic Hospital of Saint Joseph, dies at 52. How can the international community be of help? There still is much fear and denial among the general population, so funding is needed in order to organise community-based education in order to encourage people to seek treatment if they are showing the signs of fever or other symptoms. Better understanding of the need for quarantine of suspected patients must be provided in the communities. Financial and technical support for such activities already has been requested by Caritas Liberia and by the diocesan Caritas structures. The health care infrastructure in the country has been weak for many years and the present epidemic has brought it to the breaking point. Additional units to diagnose and treat Ebola patients are desperately needed in several parts of the country and especially in Monrovia. I heard stories of patients who go in taxis in order to seek treatment – all without success. The Catholic Hospital of Saint Joseph, in Monrovia, was considered the best health facility in the country, but it was closed after the director and eight other staff members died of Ebola. Today I walked the halls of the closed hospital together with one of the surgeons there that became infected with the virus but now has recovered from the illness. He sadly showed me the rooms where his colleagues, including Brother Patrick Nshamdze, director of the hospital, had died. Not only these the medical missionaries, but also the local staff with whom they worked, gave their lives because they were committed to the medical oath of serving all sick people and of upholding the dignity of the human person from conception to natural death. For them the practice of medicine was not a “business”; it was a vocation. They come from a long line of holy persons, literally a “communion of saints”, who express their belief in Jesus’ gospel by serving others and even giving their lives out of love for their most needy neighbours. The Brothers of St. John of God want to re-open the hospital but they need financial help to do so – they also will need to organise an Ebola screening unit in order to prevent any repeat of spread of infection within the hospital. They want to walk in the footsteps of their brothers and sisters in religious life who walked before them in service to the sick in Liberia, but they need the help of the international community, and especially of the Caritas confederation and of the entire Universal Catholic Church, in order to do so.